Shows with a "- R" always means a repeat. on wednesday. what Nikita? reruns? CW is known for giving their shows long breaks (Nikita will return next week, after nearly two months of absence) and since they don't have a lot of series it's not something unusual. Edit: Oh, nvm. You didn't know this was a rerun. Of course Fox topped the adults 18-49 ratings on Thursday night, but Idol’s timeslot move took its toll on the ratings. CBS was pushed down across the board, interestingly it fared worse in the later hours than at 8pm. While NBC’s “Comedy Night Done Right” exceeded its 2 hour comedy block ratings from the fall. NBC’s “Comedy Night Done Right” ratings started better than most of our readers expected, averaging a 2.8 adults 18-49 rating on the night. Community’s 2.2 adults 18-49 rating tied its second best mark of the season, up 16% from its last new episode. Perfect Couples’ 2.1 rating was far better than its December “preview’s” 1.3 rating. The Office’s 4.5 adults 18-49 rating was a season high, up 22% from its last new episode. 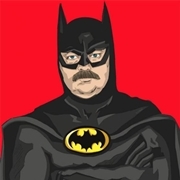 Parks & Recreation returned with a pop, its 3.2 adults 18-49 rating was a series record. 30 Rock’s 2.7 rating at 10pm, was 29% above its last new episode. Its skeptics will feast on the fact that Outsourced tumbled to a 1.8 adults 18-49 rating, a series low, down 28% from its last new episode. American Idol’s Thursday premiere scored a 7.8 adults 18-49 rating, that’s down 23% from last season’s second night’s 10.1 rating (on a Wednesday, somewhat apples/oranges). Its 22.6 million viewers was down from last season’s Wednesday start of 26.416 million. 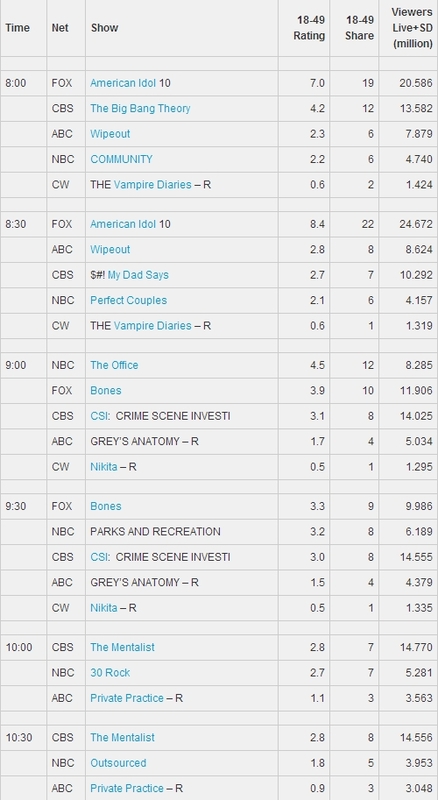 Following Idol, Bones drew a 3.6 adults 18-49 rating. That’s Bones’ best rating since 1/28/10. Note that the Fox ratings are time-zone adjusted (no other nets yet) and are unlikely to change in the final adjustments. CBS’s The Big Bang Theory weathered the Idol storm quite well, its 4.2 adults 18-49 rating was down just 5% from its last new episode. $#*! My Dad Says’ 2.7 rating was a series low, and down 7% vs. its last new episode. CSI’s 3.1 rating was down 6% from its last new episode, while The Mentalist’s 2.8 rating was down 10% from its last new episode. ABC’s Wipeout’s 2.6 rating, still impressive for reality vs. Idol (and the NBC 8pm comedies), tumbled 28% vs. last week. Hot in Cleveland, it's premiere 2.9 million viewers topped the 10pm hour for cable shows, but it was beaten for adults 18-49 by the 10:30pm Storage Wars’ 1.3 adults 18-49 rating. Top Chef’s 1.2 adults 18-49 rating was close behind, but that was down a tenth from last week. more people watch CSI than TBBT. It's the 18-49 demo, what is most important in ratings. Hot damn, I didn't expect so high numbers from NBC comedies. Maybe the station should try following in ABC's footsteps with plans of having another comedy night? I've never got the appeal of American Idol, still never seen an episode. Also could never get behind CSI the one liners right before the show goes to commercial drive me insane. I just wish one day they will get away with the Nielsen ratings and go with something else, since unless u got a box you don't count. what else is crap in your opinion? I would also add Fear Factor and World Series of Poker. Especially the second one. What's the fun of watching other people play if you can easily play on your own (even without cash if you're not up for it)? It's not like other sports where you have to be skilled, athletical or super genius. I left those two off because although i don't like them i can at least understand why people do, more than BB and Surivor anyway. aint that what makes us so great that we don't have same views, same likes? if everyone like absolutely everything you like what would the world be then? You're right. I especially like to point out your poor taste in sit-coms whenever I have the chance.